Richert's reflections on his dire plight in the trenches, taken together with what we learn about his actions, amount to a deeply felt statement of humanistic beliefs; beliefs which stood the test of his wartime experiences. Such beliefs made him highly critical of certain widely held ideas about war. Ideas which his observations implied to be myths. 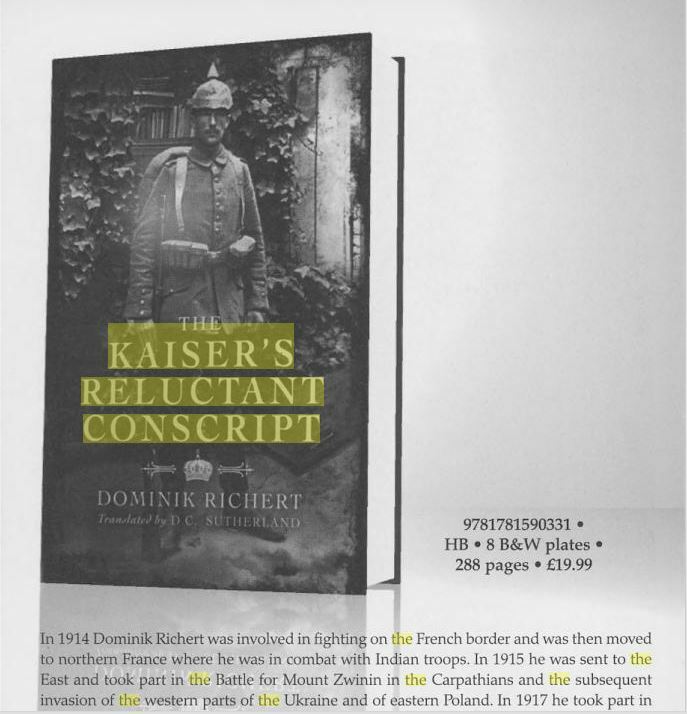 These myths, we know, must have been a necessary kind of remedial solace to the great majority of Richert's generation both during and after the war: Heroism in the name of Kaiser und Vaterland and the supposed inferiority of the enemy. Richert's writing successfully conveys the depth of his convictions to the reader. It is reasonable to suppose that he felt compelled to remember and write down what he had experienced. These two points give these war memoirs their particular character. Everything he experienced was of immense importance to him. His account unfolds in a strictly ordered sequence of events: Incidents in his day-to-day life; actions attached to the role he was forced to play in the military; his reflections on both of these. Although written in the Winter of 1918, the detailed time references in the text give his account the structure of a carefully kept diary. 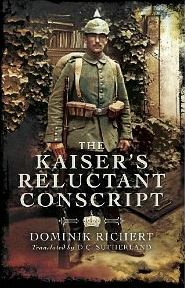 Dominik Richert's experiences in the war ended with his desertion after almost four years of active service in the trenches. On the night of July 23, 1918, he crossed over the French lines. For this he was sentenced to death in his absence by court-martial. He died at the age of 84 in 1977. As can be seen from the large number of reviews which the book has recieved, it has proved itself of interest to both social and military historians as well as to the general reader.The following reviews of Beste Gelegenheit zu Sterben may be cited as examples. – Die Zeit, 27.10.89 Ein Denkmal für Deserteure, Volker Ullrich. In 1989 the Munich publisher Knesebeck & Schuler published the wartime memoirs of a First World War private. This publication was made possible by the discovery of a typewritten copy of a manuscript found in a Military Archive in Freiburg by the historian Bernd Ulrich in 1987. Experienced in the War (1914-1918). Such a title would however be unsatisfactory from a translator's point of view. Dominik Richert's gift with words was instanced throughout his long life: As a much loved story teller within the family circle; as a respected narrator of his wartime experiences among his comrades in the rural community of St.Ulrich, Alsace-Lorraine. The reputation he achieved as a narrator is not hard to imagine for anyone who has read Beste Gelegenheit zmn Sterben. His writing style is disciplined. Most interestingly, he avoids obscuring the immediacy of a reported incident with reflections based on hindsight. Immediacy is also achieved through his close attention to carefully observed detail. He is also quick to refer to motives for actions that were uppermost in his mind at the time. The straightforward way in which he expresses himself is dramatic in its impact, and leaves vivid images in the mind of the reader. This is an unusual, educational and absorbing memoir of an infantryman’s Great War and I recommend it. Translated from German, the writing is at times a little brusque and staccato in style but my goodness what an interesting tale. The writer Dominik Richert came from Alsace, that hotly contested region that between 1871 and 1918 was held by Germany. 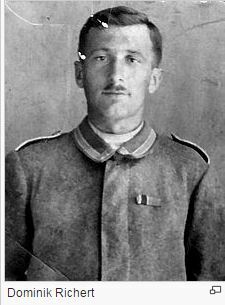 He spoke German and was conscripted for service in the Kaiser’s army in 1913, but once war came found himself unable to return home. In 1918, exhausted by his experiences and increasingly disillusioned by the war he deserted to the French forces and found himself welcomed. Richert served in some of the most important engagements of the war: the “Battle of the Frontiers” in Lorraine in autumn 1914 (in which he witnessed a German General ordering his men not to take French soldiers as prisoners but to kill them); in costly attacks against the British at Violaines in the Battle of La Bassee in October 1914; being raided by Indian troops in the trenches near Festubert; cold, hunger and madness as German troops are flung into suicidal frontal attacks against the Russians on the Eastern Front; the innovative and successful attack at Riga in September 1917; chaos in the Baltic states as Russia collapses after Lenin’s revolution, and finally back to France where he witnesses at first hand terrific British superiority in material and firepower at Villers-Bretonneux in April 1918. He was back in Lorraine when he decided with others from Alsace to get out of the war and go across to the French, an act for which he was condemned to death by Germany. Richert describes these affairs at ground level: the weariness, hunger and loss of friends. He makes few comments about tactics or the higher conduct of the war but comes to a clear belief that it is not being conducted in the interests of the ordinary soldier or people at home. We come to see him as a serious but likeable fellow, with a great love of family and his Alsace home but no great allegiance to Germany or the army in which he is fighting. For the technically minded, Richert served with the 112, 260 and 332 Regiments of Infantry, as a machine gunner with the latter. He mentions many comrades by name including a number who were killed in action and, no doubt, whose graves could be traced. The book would have benefitted from the addition of an index and a few maps (particularly for British and Commonwealth readers, of the Lorraine and Eastern Front actions simply as they are less familiar) but for all that it is a most valuable addition to our understanding of the war. Richert and his wife were deported to do forced labour in Germany in 1943. The review first appeared on The Long, Long Trail website.